Basic -- TheDiplomat.com: Aiding Africa: If Not China, Then Who? TheDiplomat.com: Aiding Africa: If Not China, Then Who? Chinese President Xi Jinping, front center, South African President Cyril Ramaphosa, front third from left, Egyptian President Abdel Fattah al-Sisi, front right,, Kenya's President Uhuru Kenyatta, front second left, Togo's President Faure Gnassingbé, second row second left, Malawi's President Arthur Peter Mutharika, second row center, Guinea-Bissau's President Jose Mario Vaz, second row right, Sierra Leone President Julius Maada Bio, rear left, Liberian President George Weah, rear center, and other African leaders clap during a group photo session during the Forum on China-Africa Cooperation (FOCAC) 2018 Beijing Summit in Beijing, Monday, Sept. 3, 2018. A full 51 heads of state made the trip to Beijing last month for this year’s Forum on China-Africa Cooperation (FOCAC). Only half as many African leaders attended the 73rd session of the United Nations General Assembly. There’s a good reason for the high turnout at FOCAC: China is Africa’s single largest bilateral financier of infrastructure projects and the continent’s most important economic partner. 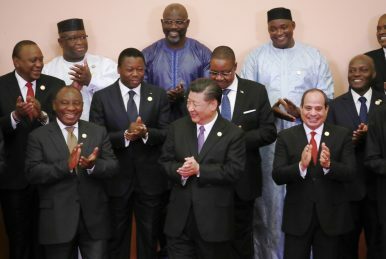 According to data from the China-Africa Research Initiative at Johns Hopkins University, the Chinese government has extended more than $143 billion in loans to African governments. At the recent FOCAC summit, President Xi Jinping offered $60 billion in financial support, doubling down on the pledge made at the last round in 2015. A significant part of this financing goes toward the construction of infrastructure in African countries, an effort which is being carried out under the umbrella of the “Belt and Road Initiative” – a colossal, multibillion dollar program for connectivity on the Eurasian supercontinent. But Beijing’s role in Africa isn’t limited to bankrolling these projects. Chinese companies, typically large state-owned enterprises (SOEs) like Sinohydro, have years of construction expertise. They also offer cheaper bids for contracts than many Western firms can afford. As a consequence, Chinese SOEs are dominating infrastructure projects in African countries. In 2015 alone, the annual revenues of Chinese companies from African projects totaled $54.8 billion. Beijing’s footprint in Africa has deepened significantly over the past decade. Under the auspices of the Belt and Road Initiative (BRI), this footprint is likely to continue its growth. For traditional donors like the United States, the question is whether, and how, they might compete with Beijing’s cheap loans and growing influence. The U.S. government seems to have provided a partial solution with the proposed creation of a new development agency – the International Development Finance Corporation (IDFC). A greatly enhanced version of the current Overseas Private Investment Corporation (OPIC), this “OPIC on steroids” should in theory provide Washington with the tools it needs to counter what government officials have described as China’s “predatory loan practices” in Africa. It’s difficult to argue against the assertion that Beijing’s infrastructure investments in Africa have yielded significant benefits for Africans, creating jobs, addressing energy shortfalls, and providing much needed transport corridors in remote areas. A recent study by Aid Data analyzed the most comprehensive database of Chinese projects ever assembled, finding that Chinese infrastructure investment reduced inequalities in developing countries. In Uganda, the Chinese-built Entebbe-Kampala Expressway cuts a two-hour commute into a 45 minute drive. In Kenya, the Mombasa-Nairobi Standard Gauge Railway replaces the colonial era “Lunatic Express,” and serves as the poster child for successful Chinese engagement in Africa. But these investments have also been the target of heated criticism by commentators and Western governments, who accuse Beijing of practicing “debt trap diplomacy.” The same, vaunted Mombasa-Nairobi railway is reported to have cost three times the international standard for a similar project. Although rhetoric surrounding the BRI suggests that associated finance is essentially aid, Chinese loans do not constitute free money. The cost of the Mombasa-Nairobi railway is serviced by a massive loan from Beijing, the interest on which will also need to be paid back. Infrastructure finance from Beijing is much easier to come by than even smaller project loans from international financial institutions like the World Bank. Not only do Chinese banks offer loans without the need for political commitments on issues like human rights, profitability assessments also tend to be less stringent. “Debt trap diplomacy” critics are not only worried about economic problems caused by irresponsible financial agreements; they are also concerned about Beijing’s propensity toward taking strategic advantage of foreign debts. Seventy percent of Kenya’s debt is reported to be held by Beijing, but Djibouti is even more heavily indebted to China. Due to the size of its economy, Djibouti also faces a particularly high risk of debt, a fact that causes concern among the U.S. intelligence community. Djibouti, strategically located in the Horn of Africa, is home to the only permanent U.S. military base on the African continent. Beijing has already set up one military base in Djibouti, and the recent nationalization of Doraleh container terminal has rung alarm bells in Washington. Commentators are suggesting that Beijing might seek to acquire Doraleh from debt-burdened Djibouti in much the same way as it strong-armed a 99 year lease on Hambantota port from Sri Lanka. From the perspective of Washington, China’s “predatory loan practices” in Africa thus constitute a security threat, as well as a general challenge to economic stability on the continent. The creation of a new development agency goes some way toward addressing these concerns. A common counter to U.S. criticism of Chinese lending is, “if not from Beijing, then from whom?” By doubling the debt ceiling of OPIC to $60 billion, the Trump administration is providing an alternative to potentially problematic Chinese loans.